What do the baked goods actually taste like? The Clog took to Sproul Plaza this afternoon to examine the culinary ingenuity that the various campus groups employed in putting on their respective bake sales. Our esteemed panel of judges include pastry connoisseur and avid baker Fiona Hannigan, whose dexterous skill in baking is well known around the Clog offices, and has been critically evaluating baked goods since she was in the womb. Joining her will be the cavernous consumer of carbohydrates, Lynn Yu, whose experience in hunting down sweet foods brings a maverick’s opinion to the table. The Clog first traveled over to the two students dressed up as wizards riding a blow-up dragon. They were leading the “Increase Hogwarts Diversity” bake sale, and were selling muffins harvested from the “enchanted Costco forest.” And no, faithful readers, we are not making this up. “We are trying to raise awareness because Muggles are an under-represented group at Hogwarts,” said Griff Godric, a sixth-year Gryffindor double-majoring in potions and defense against the dark arts. Lynn Yu (LY): Personally, I’m not too much a fan of poppy seeds, so it was just OK. I thought it was a little too sweet, to be honest. Fiona Hannigan (FH): I love poppyseed muffins, so I have to disagree. Costco muffins may be from a wholesale store, but they taste professional. They are enormous and filling, plus there’s a delicate hint of almond extract. LY: Really? I didn’t taste any almonds. All in all, we Muggles thought the Hogwarts muffins were simply average. But while the taste was just standard Costco fare, the exuberance over the admittance of Muggles that these two showed quite made up for it. Rowan and Godric were definitely two of the most enthusiastic sellers on Sproul today. Next, the Clog hit up the “Conscious Cupcakes” table. Senior Damaris Olaechea, along with her roommate Nicole Fischer, baked a large quantity of cupcakes from ingredients purchased at the 99-cents store. They had set up their table in opposition to the Berkeley College Republicans (BCR). There were two types of cupcakes they made: Funfetti and yellow cake. Beyond that, there were donations of vegan chocolate cupcakes. So what did our judges think? LY: With the Funfetti cupcake, the frosting (which was pink) was pretty solid, but unfortunately too sweet. Furthermore, the center of the cupcake was a little dry and definitely could have used a little more water during the baking process. The yellow cake was about the same as the Funfetti cupcake, but a little more dense. The vegan chocolate donation was by far the best at this table, simply due to the crunchy dome exterior of the cupcake. However, it left an aftertaste that only vegan foods can leave, which is not the most pleasing sensation to the taste buds. The best part of the chocolate muffin was that it was perfectly moist inside, which really contributed to it being the best of the three. FH: I’m a fan of redeeming vegan baked goods – after all, they get such a bad reputation, but can be so moist and delicious – and this one does the trick. I agree about the crunch, there’s nothing like the scintillating contrast between the interior and exterior of the cupcake. I appreciated that the flavor wasn’t too sweet, and didn’t mind the distinctive vegan taste at all – but then again, if you’re not used to it, it tastes peculiar. So while the conscious cupcakes weren’t the best, the earnestness expressed by Olaechea in running the stand prompted us to be conscious and give our half-finished cupcakes away, rather than throwing them in the trash. Next, the Clog walked around the silent protesters, who were at this point lying down on the ground, and wandered over to the “Equal Cost Opportunity” table, run by Allison Rea and her friend Thomas Eliot. 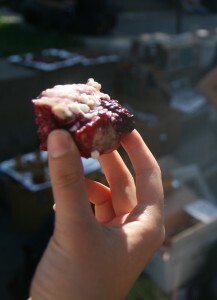 They had purchased ingredients from Berkeley Bowl and baked their cookies from scratch. They used recipes and variations of recipes that came from Rea’s family, and Rea says that the chocolate chip cookies were made from a recipe her mom had been baking for her since she was four years old. There were three types: peanut butter, chocolate chip and butterscotch almond; the Clog had the opportunity to try the latter two. FH: I love the variety! There’s nothing like a good home recipe. LY: I completely agree. And you know what I really appreciate? The fact that they got their ingredients from Berkeley Bowl. FH: Berkeley Bowl is the best, you know the ingredients are quality. And these seem like quality cookies. LY: Yeah, well I thought the butterscotch almonds were a little overdone and burnt on the bottom. There were a tad bit dry. FH: I am not biggest fan of the butterscotch almond either, it’s a little too sweet for my tastes. But the flavor is rather inventive. LY: Absolutely. I enjoyed the chocolate chip cookies — I can understand why Rea would consider them her favorite. FH: I have to go with the chocolate chip as my favorite too, although I would have used a higher brown sugar ratio. At this point, we were starting to feel a little nauseous with all the sugar intake. But we here at the Clog are committed to our jobs, and we prevailed through the sudden rush of dizziness and dived in for more. Thankfully, before we could overdose ourselves on any more pastries, sophomores Diana McCaffrey and Kamyar Jarahzadeh stepped in our paths. They were, according to McCaffrey, “anti-bad vibes” and had purchased two bags of Chester’s Puffcorns from Sam’s to hand out for free. After all the sweets we had just partaken in, the saltiness of the puffcorns was quite refreshing. They were also handing out free bananas, which we didn’t take, but looked ripe and delicious. The baked goods, which they were handing out for free, included oatmeal cookies, chocolate cookies and blondies with blackberries, among others. FH: The blondies were the best out of everything! So moist, so caramel-y, so fresh with blackberries. I need to somehow replicate this recipe – I don’t know how I lived without those blondies before! LY: I completely agree. The blondies were fantastic. They weren’t very consistent though. I believe the piece you had, by the way you keep describing it, was phenomenal, but mine was a little bit uneven and hard on the bottom. I definitely enjoyed the fruit though. FH: The unknown item we tried was alright, but rather inconsistent and a little dry. I don’t know what it was supposed to be, but I think I spotted a chocolate chip. LY: Yeah the “unknowns” were just so-so. The oatmeal cookies were light and delicious, but my favorite were definitely the chocolate cookies — very rich and full of flavor. FH: Those had amazing consistency and were nice and fudge-y. The chocolate really came through. The Independents’ baked goods were very gastronomically pleasing, and were some of our favorites. And now at last, we arrive at the group that this whole event revolved around: the Berkeley College Republicans. Approaching their stand was a mission on its own, because of all the non-eating, sign-waving Muggles standing about and blocking our path to the table. If only we could “Apparate” like the Hogwarts kids. The BCR were selling both cookies and cupcakes — the wide assortment of cookies had been purchased from Safeway, while the cupcakes were baked by members of the club. The ingredients for the cupcakes amounted to eight boxes of Funfetti, 24 eggs and a multitude of confetti colors. 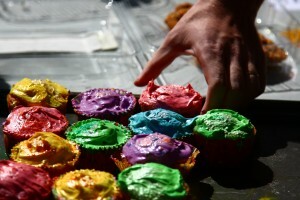 There were three different types of frostings: buttercream, vanilla and rainbow sprinkles which were dyed with food coloring — red, green, blue, and yellow. 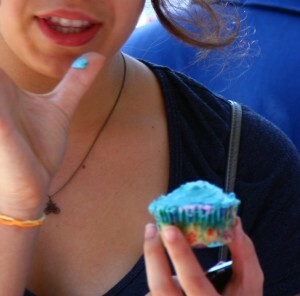 LY: The frosting had melted a little in the heat, and as a result, dyed most of the cupcake blue. I really enjoyed the presentation — they had playful and colorful wrappers and were definitely the most fun out of all the baked goods. FH: The sprinkles added a nice flair. The funfetti cake was very light and airy, without being too dry. LY: Yeah, I think the “Conscious Cupcakes” were a little denser. FH: Definitely, which is better really depends on your preference. Overall, the cupcakes were fairly sweet and moderately enjoyable. LY: They weren’t bad, but they weren’t blow-you-out-of-the-water. They were pretty average, I would say. So, what’s the final verdict? Who had the best baked goods in today’s massive sale (or in some cases, giveaway)? DISCLAIMER: The judges’ decision is by no way motivated by political biases or opinions, but based purely on quality and taste. FH: The Independent group are my pick, I was really impressed with what they had to offer. LY: Definitely. The Independents know how to bake. Their presentation was messy and could definitely could have been cleaner, but the taste was superb. FH: I said this before but: the blondies. They reaffirmed my belief in baked goods. But I love blackberries, so maybe I’m biased. LY: My personal favorite were the chocolate cookies, but then again, I’m a sucker for a good cookie. LY: Too. Much. Sweet. I could never be a food critic. Unless I get to have dinner with Fabio from “Top Chef” every night. Then, I’m there. FH: I love food, but I don’t remember what not-sweet things taste like anymore. I have a sugar headache and need to go eat real food now. LY: I just have a hankering to watch “Ratatouille” all of a sudden. FH: I’ve absorbed so much sugar that I’m going to melt. This heat doesn’t help. Well, you heard it here: The best baked goods out there today came from the Independents. The Clog sincerely thanks all the campus groups that participated in today’s event, and looks forward to the next mass protest in which we get to partake in a feast of free samples. If any of the groups today would like specific input to improve their culinary creations for next time, they can contact the Clog staff for our feedback. Until then, we will be sitting in our offices recovering from this sugar overload. Bon Appetite. Accio sleeping draught. Clog out! Note: Fiona Hannigan contributed to the writing of this post.